Are you reading this on your mobile phone? Did you check Facebook, Instagram or Snapchat when you woke up this morning? As a rabbi or educator, you might have answered no. But, for millions of people around the world, their morning routine has changed dramatically in the past five years—and things aren’t slowing down in 2014. In fact, if you were to survey your students, congregants and donors, you’d find that many people answered “yes” to the above questions. After all, if they are anything like the majority of smartphone users, they will check their phone within 15 minutes of waking up each morning! For anyone who works in nonprofit management, it’s important to stay on top of how you can effectively get the word out about an event, new class, project or cause. 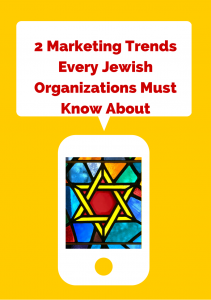 Below, we present you with what we believe are the the two marketing trends that every Jewish organization must know about in 2014. Social media sites continue to be filled with less text and more image-based content. As we’ve documented by writing about infographics (see here), you will continue to see the rapid growth of visual content continue in 2014. 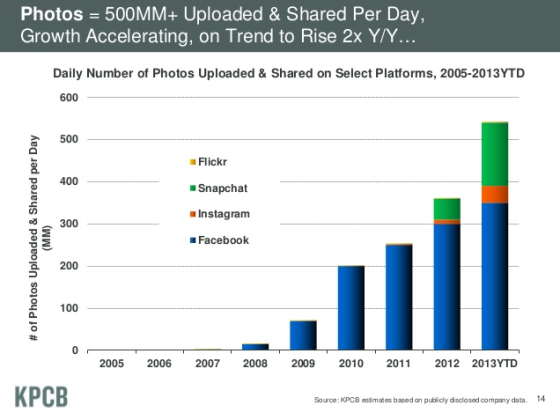 As the graphic below from Mary Meeker’s Internet Trends report shows, the number of photos uploaded and shared has increased dramatically over the past few years. And so, we encourage you to make sure that any announcement that comes from your organization looks good and will stand out. Don’t just write about the special guest speaker you are having. Instead, make sure that you have a great looking flyer for the entire event or Shabbaton. In so doing, you are increasing the chances that people will forward on your email and spread the news. Are you on a tight budget and worry that you can’t always turn to a graphic designer? Looking for a free place to create great looking content on your own? We recommend you try the following two services that we’ve previously highlighted on NLE Resources: Smore and Canva. Here’s a link to a design tutorial that Canva recently created. It’s full of great tips that will help make your Canva experience that much easier and will make anything that you design look more professional. Also, feel free to checkout our PR Samples page which will provide you with a plethora of inspiration as to what words you can use to describe an event and how your flyer should look. It’s time for nonprofit organizations to take mobile seriously. Consider this statistic: nearly 50% of emails are now opened on mobile devices. Writing in Forbes, Steve Cooper points out that when a person receives your email on their smartphone, they only see about thirty characters in the subject line. Because of this, Cooper suggests placing the most important information up-front so it doesn’t get lost. Also, make sure that your email newsletter is optimized for mobile viewing. Just because it looks good on your PC, doesn’t mean that it will stand out on someone’s mobile device. Test. Test. Test. Don’t send out your email newsletter until you send a test version and ascertain that it is legible on both a PC and a mobile device. There are many more trends and changes coming in 2014. But, if you commit to just following these two points, you can rest assured knowing that you are doing a great job of helping your organization now and in the many months that follow. Hatzlacha!